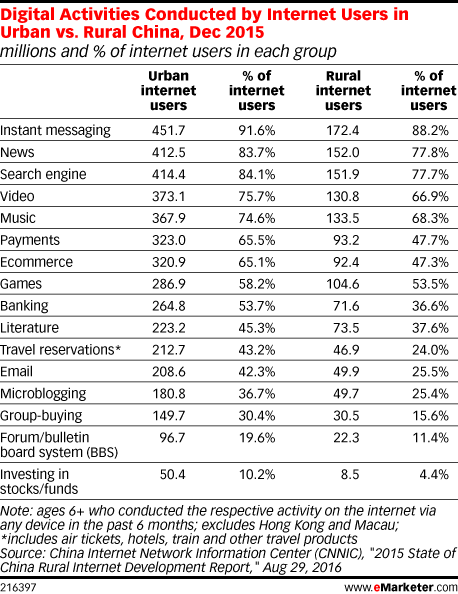 Data is from the August 2016 China Internet Network Information Center (CNNIC) "2015 State of China Rural Internet Development Report." 60,000 consumers ages 6+ living in 31 provinces across China were surveyed via computer-assisted telephone interviewing (CATI) technique (evenly split between landline and mobile phone) during 2015 (concluded on December 31). Survey samples are representative of the overall population. For the online survey, internet users ages 6+ in China were surveyed via a questionnaire posted on CNNIC's website and other sites in December 2015. The study excludes Hong Kong and Macau.